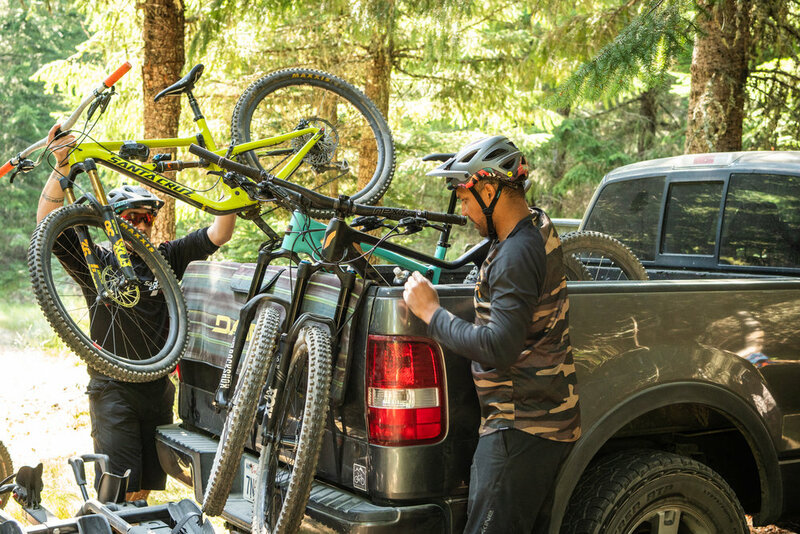 The model of the Trans-Cascadia – a backcountry, blind format, 4-day enduro race – has been built around the practice of re-opening long forgotten or neglected trail networks deep within the Pacific North West. The result is a hard-earned backcountry singletrack race with deluxe accommodation, gourmet food, and plenty of beer shared around the campfires with likeminded riders from around the world. All photographs by Dylan VanWeelden. The process to achieving this requires thousands of hours of labour annually and often years of planning before being able to move to a new area - leaving behind a legacy of rediscovered and rehabilitated trails for all riders to enjoy. This year the race is moving to a brand-new zone in Southwest Washington and through a series of work parties involving the local community, sponsors, TC Crew, and even some returning racers they have already reopened upwards of 45 miles of reclaimed trail. The basecamps of these work parties are not unlike the event itself. Roughly 50 people showed up for camping and long work days two weeks ago and were treated to gourmet meals and plenty of good times around the campfire. Much of the work required in this new region is basic maintenance, cutting back brush, and clearing out logs – hundreds of them. Due to a lack of volunteers, budget, and time, the trails had fallen off the radar and haven’t been ridden – some of them haven’t seen attention in over 20 years. Similarly, Steve Blick from Oakley has found value in actively being involved in Trans-Cascadia. “Oakley is deeply invested in the mountain bike world, so it is exciting to be involved with an event that celebrates all aspects of the sport: the athletes, great outdoors, mountain bike culture and more,” said Blick. Ben McCormack has been working with Trans Cascadia since last year and has been involved with each of the Work Parties dedicated to this new location. Sussing out the best approach when tackling such a massive expanse of potential trails takes a lot of pre-planning. “We are looking at maps and talking to people – and then looking at maps some more and prioritizing. We’ve been able to hook in with some local folks that have a lot of knowledge about the area and know what’s good and what’s worth looking at.” The progress over the hundreds of hours that have already been invested in this new location has been inspiring. “It’s amazing. Just clearing the trail – what we did today, in a day, is a big deal!” There was much excitement around the fire at the end of the weekend as everyone shared stories of what they had accomplished towards preparing this new location and some of the riding they had experienced. But the true celebration of all this work will come on September 26, when 100 racers venture into the backcountry to find what has been uncovered.